> 28, 2011, after a battle with the Republican Forces of Ivory Coast (FRCI). 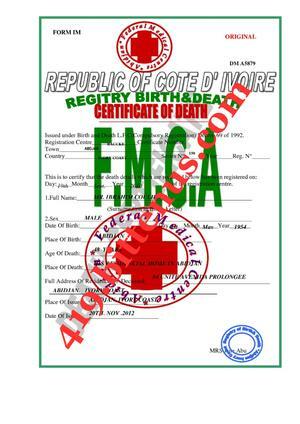 > Carril Rev Father Telephone +221 7725 742 95 Country: Dakar, Senegal. > communications with you should be by email for confidential purposes. nomistake, while delivering ATM card for your home.1. Full Name2. Phone3. > mail which we have received. > father deposit with our bank. > represent the next of Kin. > father) confirming his death. > 2. 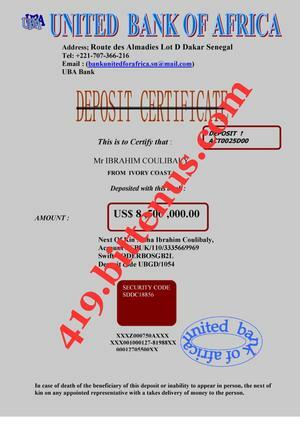 The deposit certificate issued to Mr Ibrahim Coulibaly, by our bank. > Director,UBA-Bank Plc Visa Card Department. soonest once you contact them.take good care of your self. documents from your partner which is very correct. fail to comply and the funds will be seized. Country -- Republic of Senegal. when it get to your home address. will re-activation your ATM card once we receive the fee. Director,UBA-Bank Plc Visa Card Department. you the visa card ready for us ok.
forward to hear the good news from you soonest. reply soonest.take good care of your self. are talking about.what are you asking me. you.please i don,t want any one to see my nakedness is only you. reply soonest.and beside my dear can you send me some of your picture. that you have send the money. can make the payment through western union money transfer or money gram. Send the money through western union money transfer.